I’ve slowly realized the difference between a ‘Working Mom’ and a ‘Mom on a Budget’ is honestly, nothing. Well, at least for me there’s not!! When I was working, I hated thinking about “What’s for dinner? !” The thought of planning a weeks worth of meals and then rummaging through a grocery store, usually on a Sunday night, stressed me out and was NEVER any fun! Now that I’m not working 8-4, I can at least go to the grocery store during the day, when Praise the Lord, a Car Cart is available!! But, I still HATE thinking about, “What’s for dinner?” and now even, “What’s for lunch!” AHH!! Enter, freezer cooking! I posted this picture on my FB and got a lot of questions. So I figured I’d share, although it may not be much. I was able to make 30 meals for under $200! Actually, there are 15 meals, I just doubled each. Seeing as I had been going to the store more than weekly and coming home with a weekly bill of about that, this made me (and my hubby) very happy. Hopefully now, I can just think about what’s for lunch and go to the store for just the weekly refills! Mistake #1: Making meals I’ve never had before: I’d find blogs through pinterest with the grocery list already created. I’d think, “Easy!” and off to the store I went. The problem was- lot’s of those meals I didn’t like or my family didn’t like. So it turned into a waste of time and money. Mistake #3: Choosing meals with too wide variety of ingredients. It takes way too long to assemble if there are too many differing ingredients. Not to mention, the more you buy, the more it costs. Pick a couple of easy recipes. My easy ones: Pork Chops, cream of chicken and Ranch Mix. Also, Pork Ribs, BBQ and Brown sugar. Quick and Easy! Double recipes. Gives you two meals but you only shop once. 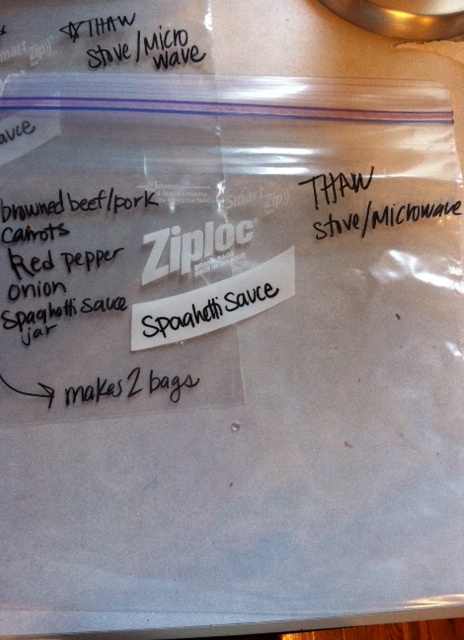 Write the ingredients on a frozen ziplock baggie before you start. Buy a bigger size and measure out. Lots of my recipes asked for 8oz Tomato Sauce or a 10oz can of Cream of Chicken. Instead of buying individual size cans, I bought the larger ones and then just measured out the ounces I needed. This was cheeper. Buy generic- but not meat. I bought all Fareway brand canned goods, and generic everything else. 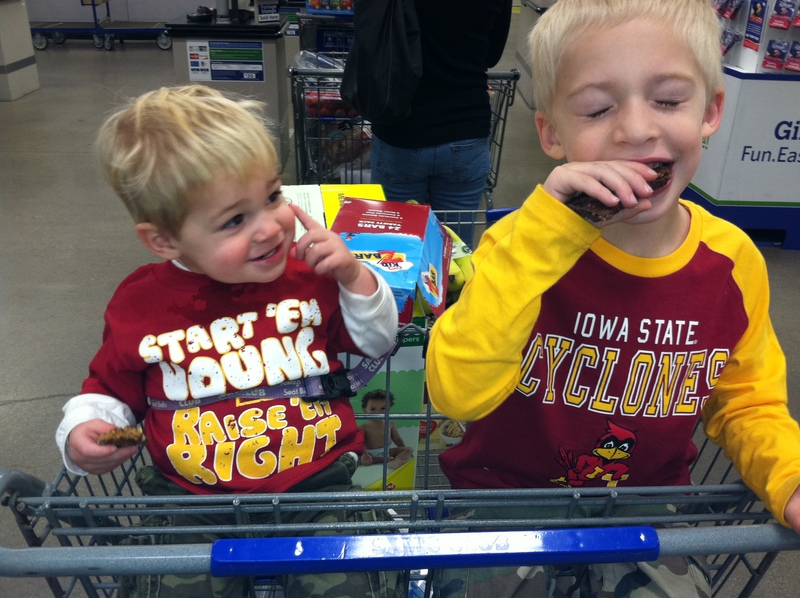 I went to Fareway for the meat- because I know it’s good. Once while shopping at Aldi’s, I used their prepackaged meat. It wasn’t good- we threw it out. Frozen over Canned Veggies. If I can’t buy it fresh- I buy frozen. Healthier choice. Substitutions: I am SO not well versed on what ingredients can sub for others. I wish I were, then I could say, “Oh look, this is on sale, I can use this instead of _____.” But I’m not- if you are go for it! You’ll save more money than me! The one I made was a BBQ rib recipe. It had all the ingredients to make authentic BBQ sauce (hence the liquid smoke). I decided, I’m just going to use BBQ sauce. Easier to prepare, less ingredients to store, and I already had BBQ sauce at home! I picked the meals I liked, copied the recipes onto a document, made my grocery list, went shopping. I then wrote my meal titles, ingredients, and preparation directions on each freezer bag with a sharpie. Then I peeled, chopped, and filled. Thanks for linking to me! Glad to see you were able to make freezer cooking work for you! It is such a HUGE blessing to not have to worry about dinner. 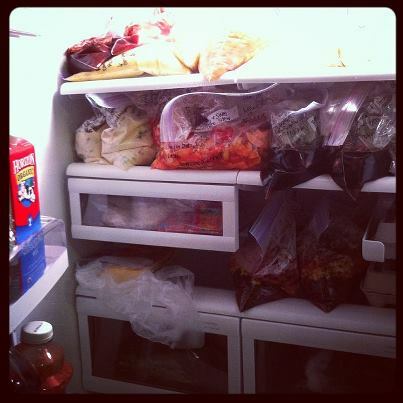 It’s funny you posted this as I just finished doing a batch of crock pot freezer meals today! Thanks Alisha! I know, couponing is the next phase. I just don’t know if I’m organized enough 🙂 I’ll check out her blog. Thanks for sharing! !